WesSpur carries heavy duty bucket covers, fiberglass chainsaw holders, and tool holders. We also have critically important self-rescue systems and fall-arrest harnesses. Let us know if there is an item for your bucket truck you don't see here that you would like to order, and we will try and find it for you. Sterling FCX Evac Kit New in 2019! The FCX Bucket Evac Kit is a compact, emergency egress system beneficial for utility personnel or arborists working alone in a lift. This kit features an auto-locking FCX Descent Control Device with smooth modulation for easy control, as well as a spring-loaded handle that stays out of the way until loaded. 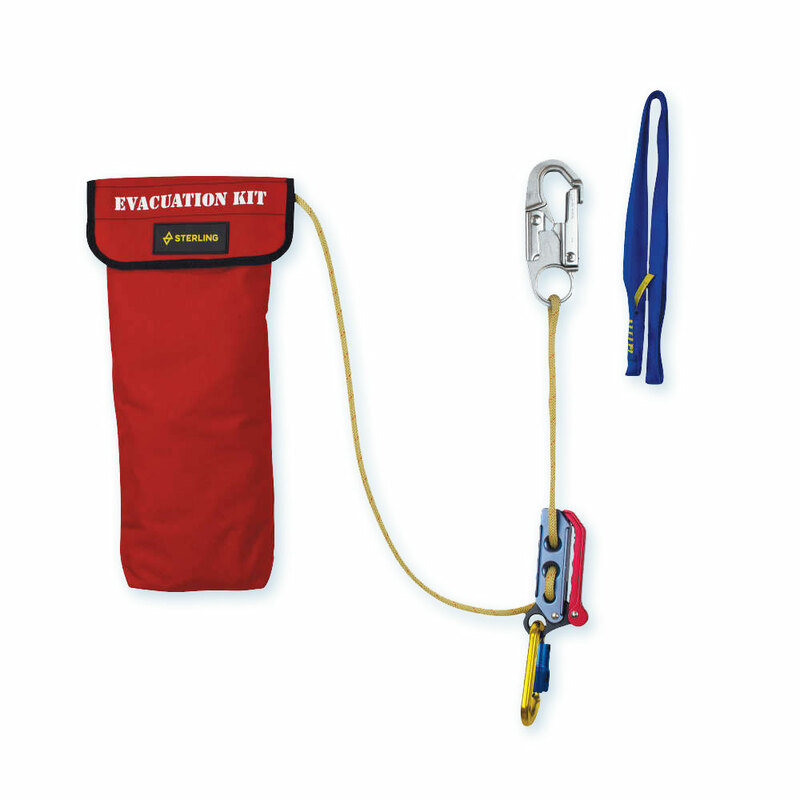 Paired with the SafeTech Escape Rope, this kit provides a controlled evacuation when needed most. The low-profile bag can be easily secured inside the bucket and stays out of the way until needed. Meets ANSI Z359.4 Self Rescue System. The FCX is Sterling's most advanced self-rescue device - it puts control in your hands. Superior descent modulation and over-pull protection. Click-to-neutral capability makes quick work of horizontal movement. Spring-loaded handle stays out of the way until you need it. Elevated side rails eliminate glove and sill interference. At 7.8 ounces of precision-machined aluminum, the FCX gets you out of trouble and home safely. Buckingham bucket truck covers are constructed of very heavy duty vinyl. A sewn-in bungee cord with a snap on leading end secures the cover to keep water, dirt, leaves and debris out of your bucket. One or two person versions available. The single person cover is also available with a 29”x29” peaked fiberglass insert to increase water drainage. This durable bucket cover is constructed from 8oz vinyl to fit standard one-worker buckets. 21” bungee strap with a stainless steel snap. 24” x 24”. Buckingham fiberglass chainsaw scabbard hangs on the edge of your bucket and stores your chains saw in an easy to reach position. Durable fiberglass construction. This version of the very popular fiberglass chainsaw scabbard has an additional layer of high-density plastic in the pocket, making it much more durable when under heavy use, and extending the service life. Jameson chainsaw scabbards are water-repellent and UV-resistant; designed to withstand extreme weather conditions. Adjustable clamp bracket models fit any size bucket, with or without line, inside or outside bucket. Jameson's chainsaw scabbard fits standard and hydraulic pistol-grip chainsaws. It features an adjustable clamp bracket, and is also available with a removable liner to increase durability. Chainsaw scabbard includes a handsaw holder for easy access during line clearance work. To prevent blade wear and protect against extreme weather conditions, the scabbard is constructed with durable HDPE. Jameson's long reach chainsaw holder mounds on the bucket itself instead of the boom, placing your long-reach saw in an easily accessible spot. 18” x 13”. Holds both round and oval handled long-reach chainsaws. We stock a variety of square-boom tool holders. We stock a variety of round-boom tool holders. Plastic bucket clips. Sold in pairs.